You can be confident that your stay at Goldfield Holiday Units will ensure that you have an enjoyable and comfortable stay in Bright. We have been rated by the RACV in the top 10 High Country establishments in Victoria. We are one of only a few holiday apartments with direct frontage onto the beautiful Ovens River. Goldfield Holiday Units have recently undergone remodelling and redecorating. 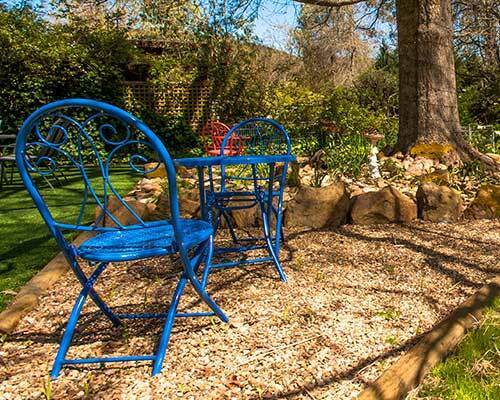 One of only three holiday rentals in Bright boasting direct access to the beautiful Ovens River, Goldfield Holiday Units has undergone meticulous remodelling and redecorating. Samantha and Marco have been residing and running businesses in Bright for 18 years and are able to provide their guests with a wealth of local knowledge in addition to superior hospitality. An intimate complex of only 6 units set amid more than an acre of lush gardens (offering fully equipped BBQs and alfresco dining) within a 5 minute walk of Bright’s energetic town centre, Goldfield Holiday Units promise to be the perfect base for your summer and winter holidays.